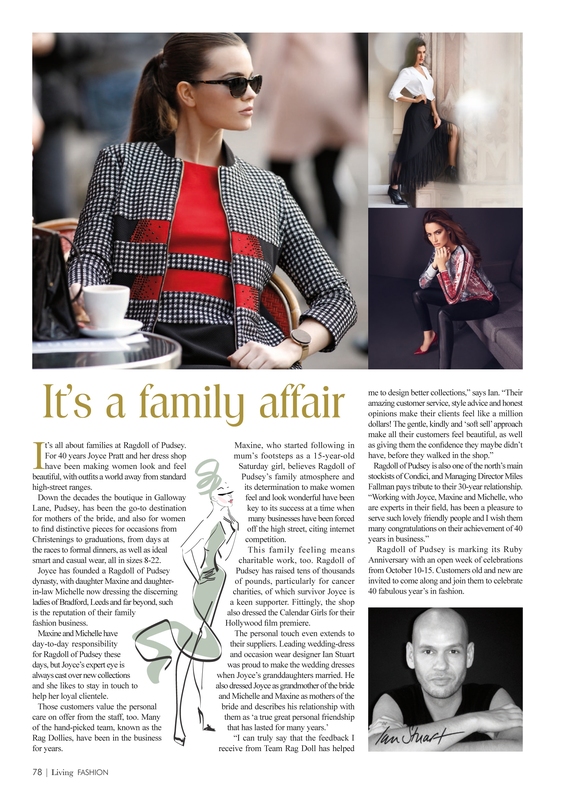 Rag Doll specialise in high end day and occasion ladies wear and accessories and have used Living magazine as an integral part of their marketing approach. Living magazine gives us the perfect platform to promote our fashion business, we are able to target and highlight seasonal trends and through the product placement support we receive from Sue, our Account Manager we are able to showcase our diverse range of stock that we carry from daywear to special occasion wear. Advertising in Living delivers a good response - increasing footfall ,email enquiries and phone calls. We look forward to developing our advertising with Living again this year. - Maxine Thornton, Partner- Rag doll of Pudsey.